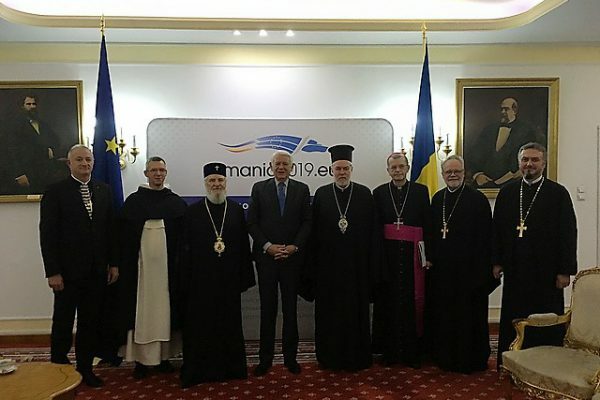 The delegation was composed by representatives of Commission of the Bishops’ Conferences of the European Union (COMECE), Conference of European Churches (CEC) and Committee of Representatives of Orthodox Churches to the European Union (CROCEU), who shared their perspectives on the four priorities of the Romanian Presidency: 1) Europe of convergence; 2) A safer Europe; 3) Europe, as a stronger global actor; 4) Europe of common values. The delegation enjoyed dialogue with the Romanian Presidency about the importance of putting the human person at the center of increasingly digitalised societies. They also emphasised the importance of a comprehensive view of security, environmental concerns, and improving religious literacy through education. The open and transparent dialogue between Churches and the respective EU Council Presidencies is part of a long-standing practice now supported by the Article 17 (3) of the Treaty on the Functioning of the European Union. · H.G. Bishop Reinhardt Guib, from the Evangelical Church of the Augsburg Confession in Romania.